As a follow-up, you will receive an email with links to resources for writing a website redesign RFP. This is the second in a series of webinars that Gravitate will be hosting over the next few months. It’s an activity we were doing regularly back in 2012 but lapsed for a bit, and now we’re resurrecting the tradition. My name is Lynn Elyse, and I’m here with my colleague Flynt Johnson. We’ve both been New Business Consultants at Gravitate for nearly four years now, which means we spend most of our time talking with people in varying stages of readiness for hiring an agency to redesign their website or perform SEO and digital marketing. The funny part is that since Gravitate only brings on one or two new clients each month, we spend the vast majority of our time talking with people who will probably never be our clients. Our conversations with people go beyond simply talking about our services. In fact, we probably spend far less time talking about our services than we do listening to people express their hopes and frustrations not only with their website, but also about their overall marketing effort. Over the years, we both came to realize that between the two of us, during these conversations, we’ve accumulated knowledge that’s valuable to a lot of marketing managers, and we figured, why not share it with everyone? So that’s the reason we’re participating in the Gravitate webinar series, and we hope you will gain insight today that you’ll be able to apply immediately toward your work as a marketer. When it comes to using an RFP to hire a website designer, most agencies don’t like them, and some outright refuse to consider responding at all. And we get why: when the RFP process is conducted poorly, then frankly, it’s an annoying waste of time for everyone. (We can both tell you stories about 45-page RFPs asking 75+ mostly redundant questions—no exaggeration!) But when the process is done right, they can be a great way for a company and an agency to determine whether they’re the right fit. 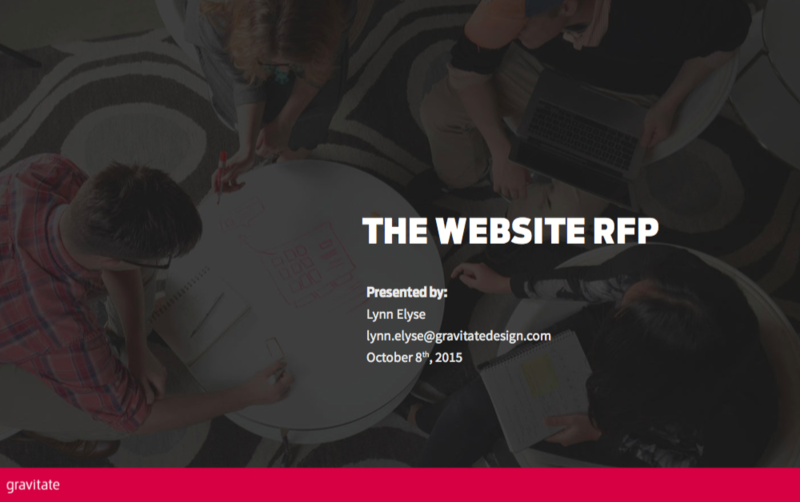 Some of our favorite clients and most advanced websites came to us through an RFP. The second most important thing to know about an RFP is this: the value in using an RFP process to select a website agency isn’t what you think it is. Many people think that an RFP will give them the most value for their dollar—they’ll be able to make an apples-to-apples comparison and choose the option providing the most features at the lowest cost. You know, that might work when you’re buying a product, but it’s useless when you’re buying a service. The #1 thing to know about an RFP? The highest value of an RFP process is confidence that you’ve selected the right agency to do the right work. Okay, so this all sounds great, but how to get started? Well, you need to start with the end in mind. And when I say “end,” I don’t mean the day the new website launches. I mean that you should envision how the website will help to achieve your organization’s goals six months after launch, or one year, or two years, or even more. We really can’t overstate the importance of identifying problems. The number one mistake we see with RFPs is when they dictate a solution instead of stating a problem. You’re hiring an agency for their expertise with interactive design and online behavior—let them do their job! Identifying problems leads to articulating needs; your ultimate goal will be to explain your needs in the most helpful way possible. The time it takes an organization to select an agency is a gauge of the time it will take to complete the website project. We’ve had companies take six months to select an agency, and then want a custom website completed in two months. Guess what? It’s not going to happen! They’ve got internal dynamics that I guarantee are going to drag it out. Notice the suggestion to talk with prospective vendors before you write the RFP. This is both a time-saver (Are you really going to read 20+ RFP responses? Do you really need to specify “responsive design” when every legitimate website designer does it as a default?) and it will help you identify your real problems and needs. Involve the decision maker as often as you can. We get why most decision makers want to stay scarce, but it prolongs the process and forces the influencer into the role of translator. Once you’ve defined your needs, mapped out your RFP schedule, and assembled the participating parties, it’s time to write the RFP. We’ll provide you with some resources, but the truth is, writing the website RFP shouldn’t be hard. If you’re finding it difficult, it’s a sign something is wrong: you either don’t really know what you need or you’re trying to dictate the solution. Or, you’re involving the wrong people in the process.